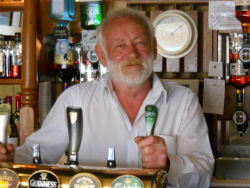 After 25 years exceptionally loyal service Barman Geoff has finally retired from The Pierhouse. With a 'heart of gold' as described by many a returning guest, Geoff has decided it is time to head south to Cornwall to be with his family. 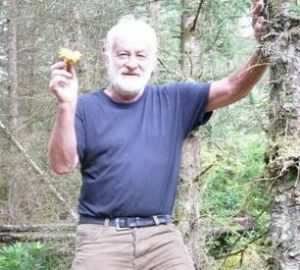 Besides looking after the Ferry Bar, Geoff is also renowned as the "Chantarelle king" and has been foraging the region for these tasty golden mushrooms to supply our kitchen for many years. In recent weeks we have been making time to go up the hills with Geoff to be shown the secret little places where the chantarelles can be found! We wish Geoff all the very best of good health in his retirement and hope he will still from time to time come and visit us. We are hugely grateful for everything he has done for the good name of The Pierhouse. PS. When we posted news of Geoff's retirement on our Facebook page, local people and customers from far and near left some lovely comments for Geoff - thank you very much.